Filmed live to capture the intimacy and detail of one-to-one instruction, Vinyasa Flow Yoga is an experience to reconnect you to your personal sense of Spirit and strengthen mind and heart, as well as your body. Exhilarating for anyone who seeks more than a physical practice. 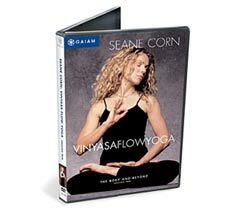 DVD (143 minutes) includes live-audio Instructional Session; DVD also includes the full practice guided without verbal instruction; plus a candid conversation with this woman known for her refreshingly honest take on yoga, spirituality and life. With Seane Corn. Read more and view video clips below.